Remember when I posted about the Case of the Headless Snowman? The mystery has been solved. The Barcalounger ate the snowman's head along with numerous other toys. I found them all hidden inside a compartment in the bottom of the chair that houses the footrest mechanism. LOL I love it! Our chair prefers money and crumbs. Happy WW! LOL! Hey..let me know where missing bows go! Did it eat my bows too? That's hilarious! ROFL, love it! How in the world does all that even fit in there? Too Funny! My chairs prefer socks and shoes! That is funny! 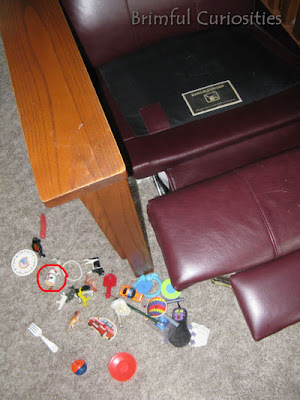 I think our recliner has eaten a lot of our kids' toys as well. Too funny! The couch is usually the guilty one in our house. You never know what you'll find in there! Ours usually eats the TV remote. Along with a few toys too.